Despite a climate of political uncertainty and anxiety, a notable calm is expected to ooze from one corner of Leinster House this afternoon. TDs, senators and Oireachtas staff have been afforded the opportunity to partake in an eight-week mindfulness pilot programme. According to the organisers, week one is booked out. Mindfulness, according to the Cambridge Dictionary, is the practice of being aware of your body, mind, and feelings in the present moment, thought to create a feeling of calm. Bringing mindfulness to the Oireachtas stemmed from a visit by the head of the Women's Caucus and Deputy Green Party Leader, Catherine Martin, to the first world summit on mindful politics in London two years ago. MPs in Westminster have been doing it for years, apparently. Look closely enough at Prime Minister’s Questions in the House of Commons and you may be able to spot the mindful Members of Parliament. According to Ms Martin, it is time for politicians to learn the difference between response and reaction, and whether decisions are being made from a point of balance or equilibrium. 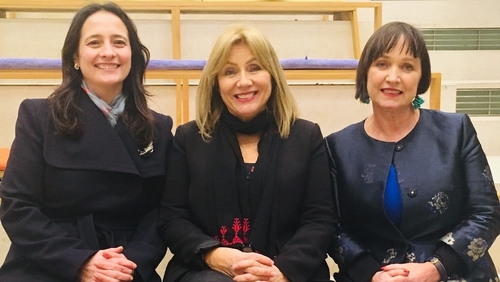 Ms Martin worked with Fianna Fáil TD Fiona O'Loughlin and Independent Senator Frances Black to explore whether mindfulness could be introduced in the Oireachtas. A not-for-profit organisation, Mindful Nation, brought the Welsh Labour Party politician Chris Ruane to Ireland some time ago to explain his introduction of mindfulness to the House of Commons. One of the missions of Mindfulness Ireland, according to its website, is to encourage the practice of mindfulness within the political system, the workforce, healthcare, education, environmental and justice sectors. The pilot course, which is being funded by the Oireachtas, will run for eight weeks and if attendees decide it is worth keeping, they will pay for subsequent courses. Wandering around Leinster House I asked some elected representatives if they had signed up. One health spokesperson had not heard of mindfulness, another TD said he pumped weights in the gym, which was sufficient to burn off the required steam. One media press officer had not heard of the pilot scheme, while a second health spokesperson replied: "Mindfulness? C'mon now!" Time will tell whether the number of people expected to attend will be consistent in their commitment to an hour of mindfulness a week. So, if constituents note increased awareness and a deeper sense of compassion from their elected representatives over the coming weeks, it does not necessarily mean there's a general election around the corner.